The painting is unusual in other ways too, notably for Dadd's choice of subject and his use of muted colours. A pastoral scene seems an unlikely choice for a patient incarcerated in an institution, but both Allderidge and Smith agree that Dadd was inspired here by one of the Idylls of Theocritus (e.g. see Allderidge 104), and that the classical ruins in the background derive from his memories of his eastern Mediterranean travels with Sir Thomas Philip, even though these took place nearly forty years before. Like the musical instruments, the ruins may well have been painted from the sketchbooks he had kept with him from that time. Dadd loved music and played the violin, and would have been interested in the whole concept of travelling musicians. The larger landscape may owe something to the views from Broadmoor over Berkshire. And, as in the case of his watercolour sketch of Crazy Jane, the rather inexpressive faces of the musicians may have been sketched from those of his fellow inmates at the institution. The tableau — the female musician in her wide-brimmed bonnet and layered garments, the rustic with his pipe and shepherd's crook, and the smaller figure listening in a contemplative pose — seem reminiscent of nursery rhymes or children's stories, especially in these pastel shades. There is Dadd's predilection for tiny details, as well, in the attention he pays to the weeds growing among the crumbled stone. All in all this painting seems to recall and record much that Dadd had loved and experienced. There is a (probably later) watercolour version of it too. Allderidge, Patricia. Richard Dadd. London: Academy Editions, 1974. 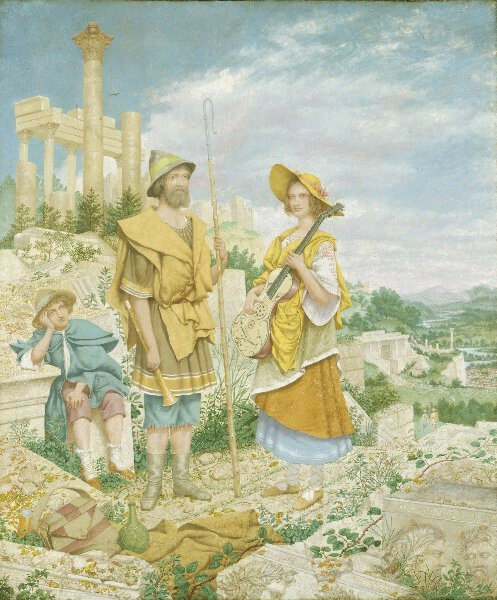 "Richard Dadd: 'Wandering Musicians.'" Peter Nahum at the Leicester Galleries. Web. 20 August 2017. Smith, Alison. "Richard Dadd: Wandering Musicians." Tate. Web. 21 August 2017.